Growing up I remember my mom spending hours at our local gardening center picking out her annuals for our bazillion planter boxes. Being a kid I would get dragged along and initially hated every second of it. ‘’Why does she have to look at every single flower? They’re all the same, just pick one!’’. As the years went on I slowly became more interested in it. I began to learn her favorites by name and why she was choosing certain flowers over others. On top of my mom’s love for annual planter boxes we also had many perennial flowers on our property which required some maintenance but were, for the most part, pretty self-sufficient. It took a few years but by the time I was about 12 I had a genuine interest in gardening. This late spring tradition is something I’ve already started with my daughter, just three years old. When I asked if she wanted to help Mommy pick out some flowers she immediately lit up and demanded I get ‘’all the pink ones’’. While she hasn’t quite grasped color variation she will learn I’m sure. 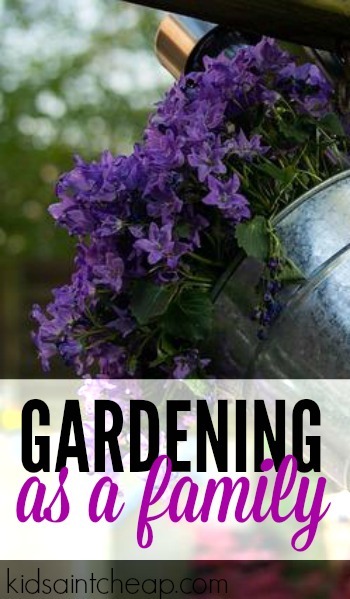 Gardening is something that families can do together and it is something that fits every budget. If my budget was unlimited I could spend thousands every year on gardening stuff from lawn care to my own annual planters but I don’t. I usually set a budget of about $50 per year to buy annual requirements and it seems to satisfy what me and my family require. I limit my annuals to four planter boxes. Two in front and two in the back. I mix them up with a few larger established plants, inexpensive fillers like tall grasses and smaller less mature plants and allow them to establish themselves through the summer. For new soil and flowers I spend about $30. The rest of the money is usually spent on new herbs and a few veggies. I buy them in the summer, keep them outside then move them inside for as long as they live through the fall and winter. 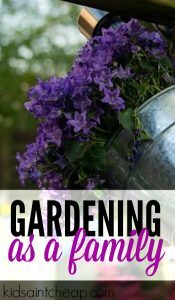 Growing herbs and vegetables is a great way for families to all be involved. Kids have fun planting and helping to ‘’take care’’ of the plants which they can then eat. If you’re fortunate enough to have an in-ground garden to grow these types of things it’s great. If you don’t, you can build one for cheap (check our Pinterest for ideas). The only reason I don’t have an established garden is because the only ‘’perfect spot’’ for such a garden is smack in the middle of our back yard which would drive us crazy mowing and this isn’t our forever home, I don’t want to rip apart the yard for a garden someone else may hate. We grow in containers and it usually does well, our deck gets great sun exposer. Our daughter has a little watering can she can use to help water the plants. She will also be able to help pick the herbs and veggies as they mature and she can learn about the whole plant to food process. Gardening is something I love doing. It’s something that can really help a family too- learning to grow your own food- as well something that can be truly enjoyable and an activity entire families can do together. Do you garden with your family?